Star Trek/Settlers of Catan sets phasers to "SHEEP!" That said, I'm looking forward to alienating my loved ones with and/or playing Star Trek Catan, a Federationized take of the resource trading board game. I wager the Kirk card involves a wrestling match with an unwilling trading partner. The German release for Star Trek Catan has been announced thus far for March 2012 with the English translation hopefully on the way soon. Time to dust off the old Deutsch 101 in the meantime. If this version of the game involves a trip to the Romulan Obst-und-Gemüseladen, I can manage. For another Catan variant, check out Oil Springs of Catan. 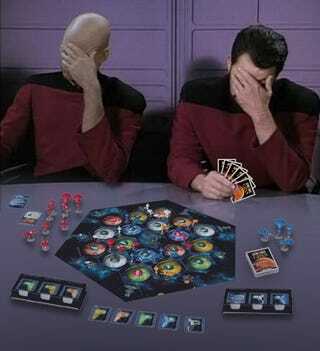 Board Game Geek via Geekosystem. Top image by Gavan Brown. Hat tip to Seivewright!